Tour like a local while you experience a personalized walking and driving tour of urban nature in Atlanta — it's considered the most forested major city in the US, where even the main street is named after a tree. You'll travel by private vehicle to roughly half a dozen city parks with your guide. Meet your guide at a designated point and set off on a private driving tour of Atlanta's forested urban areas in the morning or afternoon. You'll get out to explore your natural surroundings on foot at various locations throughout city. Take a walk though the largest urban development project underway in the US as you explore some new trails and parks at the Atlanta BeltLine, and learn about the revitalization of this former railway line. 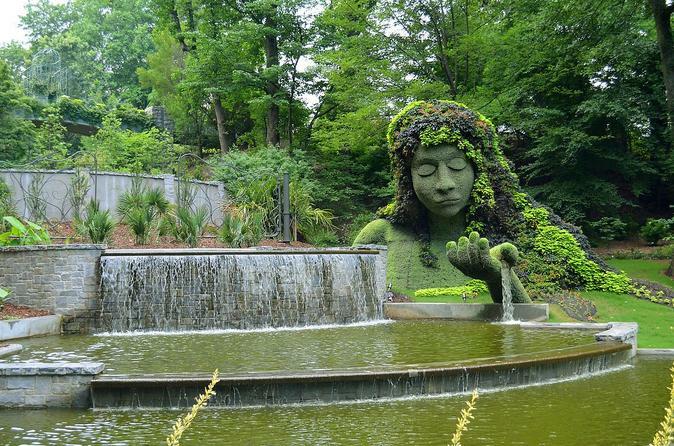 At Piedmont Park, stroll part of the 189-acre (76-hectare) urban green space, home to the Atlanta Botanical Garden, which includes a 40-foot-high (12-meter) canopy walk through the forest. Continue on to Olmsted Linear Park, developed by Frederick Law Olmsted, the landscape architect of NYC’s Central Park. Admire the stately homes of the Druid Hills neighborhood before you explore Grant Park, the oldest park in the city and home to Zoo Atlanta. This 131-acre (53-hectare) park is surrounded by the largest collection of Victorian cottages and craftsman bungalows in the city. Don't miss Centennial Olympic Park in downtown Atlanta. This center for the 1996 Olympics includes the Fountain of Rings and memorials to the athletes of the Centennial Games. Your 3-hour tour concludes at the starting point.